To the parent of a new snowboarder or to the outside observer, snowboarding terminology and lingo are an entirely different language all its own. If you have just been bitten by the snowboarding bug, or if you have a friend or relative that has become a participant, you may want to learn the vocabulary that revolves around this unique sport. Involving the basic snowboarding, equipment used, and the enviroment encountered when learning to snowboard at a ski resort. Snowboarding Terminology: Snowboarding is in its most basic definition, is the combination of a rider standing sideways on a snowboard, gravity and a slipery slope. The rider uses body movements and the characteristics of the snowboard to control his or her direction and speed down the slope. They can pick and choose their line down the hill or mountain. Snowboarding can feel unnatural to a beginner and very ofter the first couple days are quite challenging to get through. But once a rider learns the basics of the sport they will start to feel more and more comfortable and progress in skill level quite fast. This makes snowboarding and even learning the snowboarding terminology very fun, even for a beginner. Turning a snowboard may be executed with a full range of skill level and preceision. A beginner or skidded turn, it she most basic type of turn. As a beginner, the rider usually initiates the turn by standing with the majority of the riders weight on the front foot, then kicking the back or uphill foot out to one side or the other then applying general pressure to the edge of the board allowing it to skid slightly sideways and to carry the rider through the turn. The skidded turn is a first crucial step for a beginners advancement, and it is a useful way to control speed and to add variety and flair the riding of a more advanced rider. A carved turn is an advanced level turn in which the rider initiates the turn just by using his or her body to precisely pressure one edge or the other. With an acurate body movement and pressuring of the edge, combined with the shape of the board allows for a pure arching turn. In this type of turn the edge at the tail of the board that is holding the turn will pass the exact same spot as the edge at the tip of the board. This type of turn is faster than a skidded turn in both quickness of the turn as well as the speed caried out of the turn. A carved turn will leave a precise slice or carved arc in the snow while a skidded turn leaves a wider slide or skid mark, also with an arcing shape. Stopping a snowboard requires turning the board perpendicular to the fall line or down hill direction of travel and applying adequate edge pressure to bring the board and the rider to a stop. It is a challenging part of learing to ride a snowboard, but once it is mastered, it becomes second nature and very easy to execute. Snowboards are constructed from a variety of materials including wood, fiberglass, high density foam, polyethylene base material, steel edges, a variety of graphic techniques to add style or character to the appearance of the board, and extensive research and development to determine a desired shape and flex that will create the function and performance of the snowboard. The most common rider demands include freestyle, freeriding and back country. 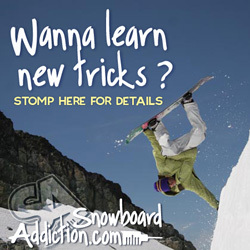 While an entirely different style of board, binding and boot setup are designed for carving and racing. A skilled freestyle or freerider can carve good turns, but a carving setup with a stiff carving board, plastic shelled boots and plate or rigid binding allow for a much higher level of carving performance. Snowboarding Boots are constructed from rubber, plastic, fabric and all sorts of materials required to provide warmth and performance. There are many types of boots reflecting many riding styles and performance demands depending on the type of snowboarding the rider intends to participate in. Nearly all snowboard boots have two primary parts. The basic snowboarding terminology related to boots include the shell or the outer layer of the boot, which provides the flex of the boot and determines the type of binding to be used. The second part of the boot is the liner. The liner will provide the snug fit, ankle support and warmth required in any snowboarding boot. Most boots sold and used are much like a basic snow boot, with a soft plastic or rubber shell designed to fit into a strap, baseplate and highback type of binding. Freestyle boots designed for freestyle and tricks will offer good ankle support while being flexible in the upper boot to allow for the flex required to perform popular positions and "tweaks" which define the style and name of the trick being executed. Freeriding (all mountain riding) boots have a stiffer overall flex to add to the body to board responsiveness, yet still flexible enough to absorb and maneuver through the variety of terrain, bumps, and changing conditions that a freeriding snowboarder will encounter. While performance carving boots have a harder plastic type of shell with a toe and heel block defining the length of the boots sole that will lock into a plate or rigid style binding. This setup provides the ultimate in body to board responsiveness and is designed for the carving or racing enthusiast. Snowboard Bindings have come so far. When I started riding bindings were uncomfortable and prone to breakage and screws and parts that would fly off at the most inconvenient time possible. Today, bindings come in many different styles, colors and functions. Relating to the above paragraphs, I am sure you can guess the main functions and performance demands. Freestyle or Freeride, and carving. Freestyle or Freeride Bindings are usually constructed of plastic and/or metal. They consist of a baseplate that is the mounting or connection point to the board and may or may not have a detachable heelcup. Straps connected to the baseplate hold the boot in place and provide support to the boot and foot while the highback, which extends up the back of the boot from the heelcup provides support and leverage towards the heel edge of the board. For a high performance carving setup, a rider uses a Plate Binding. It is a rigid plate that mounts to the board much like the base plate of a freestyle type binding only there are no straps or highback. A plate binding has bails that loop over the toe and heel blocks on the boot. Some have a clip or clasp on the toe, some on the heel. All provide a solid connection from boot to board. In this case the outer shell of the boot provides all support for the ankle and leverage required to execute high performance carved turns. Outerwear -(aka)- Snow Pants and Jacket Having appropriate clothing and outerwear is so important to make sure that you are comfortable and safe. A good jacket and pant is functional and stylish. Functionality involves adequate water resistance, durability, breathability, good fit, functional pockets and design that works well with the needs of the rider. Many companies are making amazing outerwear and it is an enjoyable project to shop for the gear that will add to the enjoyment and comfort of being out in a winter wonderland. Layering and Good Socks are key to keeping your body and feet comfortable and dry no matter how hot or cold the environment is. A rider layers by wearing other lighter weight gaments underneath their outerwear. Nearly any clothing (like t-shirts and flannel pants) can be used to layer, but using the right kinds of materials can make all the difference. Good underwear, tops and bottoms will make the rider more comfortable for a much larger temperature range. It can help hold in body heat when it is cold, and it can pull the moisture of perspiration away from the skin to keep you dry. Avoid cotton, as it will hold the dampness against the skin and can lead to discomfort. Look for long underwear and socks made from wool, nylon, polyester, polypropelene, thinsulate, and other materials created for the soul purpose of regulating body temperature. and explore the styles and technology of modern eyewear. Terrain Parks have recently become more and more common across the country much to the delight of trick loving snowboarders and free-skiiers. Full of unusual snowboarding terminology, terrain parks often include Halfpipes, Tabletop Jumps, Rail Slides, Spines, Hips, QuaterPipes. Parks are not for the beginner, but once a rider starts to learn to use terrain features and to do tricks they will continue to have more and more fun as the progress continues. Terrain parks can be a little dangerous, but if you are observent and repectful you can learn how to stay safe. Here is a cool little video to introduce you to Terrain Park Safety.